Attention all gamers. 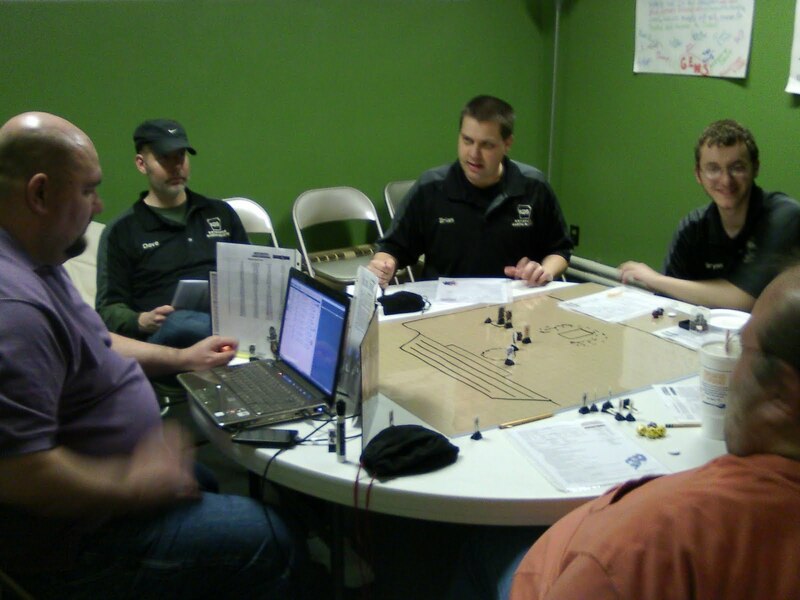 KGS will be hosting a game or games at the Comic Store West on Saturday March 12 for their FREE RPG DAY. Please add comments to this post for suggestions on what we should play. Local Comic Store Owner Becomes Zombie... or Does He? 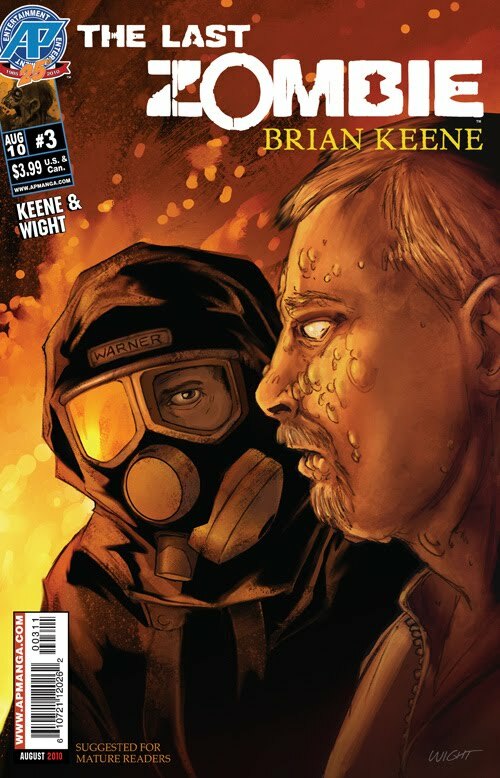 One of the owners of another York-area comic book store, *content deleted*, was recently featured on the cover of The Last Zombie. The blonde guy on the right side of the comic was modeled after Ned Senft. It's actually a very close resemblance. How did he get onto the cover of The Last Zombie #3? Either the creators REALLY like him or REALLY hate him. I'm guessing the prior since Ned is such a good guy. Either way it was a great way for the creators to get their comic promoted heavily in at least a few comic stores! So what's the deal? Is Ned a Zombie? If so, how did he become a zombie? You'll have to read the issue to find out. But I think the bigger questions is, when will we see the local comic creators turn Brett into a vampire or transform Brian into a *gasp* human being? I love listening to "actual play" tabletop RPG podcasts. If you look beyond the lack of professionalism, occasionally bad audio, and people talking over each other, real creativity and brilliance can be heard from both players and GMs. It's also a good way to learn about RPGs or campaigns you might not otherwise get to play. One of the original and still best places to find these podcasts is at http://www.rpgmp3.com/. 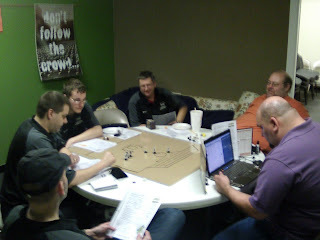 And the best place to start is the World's Largest Dungeon, the podcast that started it all. Five gamers from England started playing the 3.5e module, World's Largest Dungeon, back in 2004 and decided to record their sessions. They finally finished 3 years and 40 sessions later. This kind of long-form, epic storyline would be impossible in any other but the podcast medium. Listening to these episodes, I really got to know both the players and the characters, vicariously travelling with them on their epic journey. 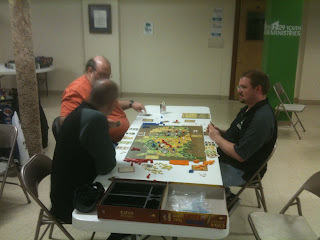 If you finish WLD, check out anything from the Whartston Hall Gamers, also on the same website. 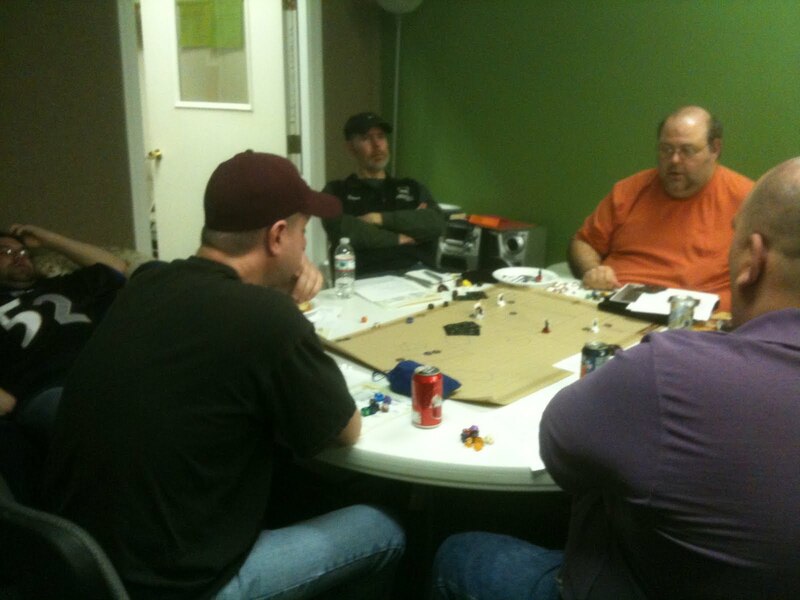 This group of gamers from Manchester, England generate truly funny and classic RPG sessions. As one person stated, they are the "Masterpiece Theatre" of RPGMP3. Great news! Looks like we're going to get a source book for one of our favorite games. "No, no magic, I'm afraid. 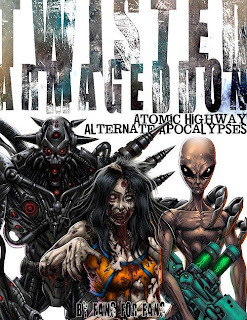 Aliens, cybernetics, zombies, killer robots, retro-future and alien tech in this sucker. 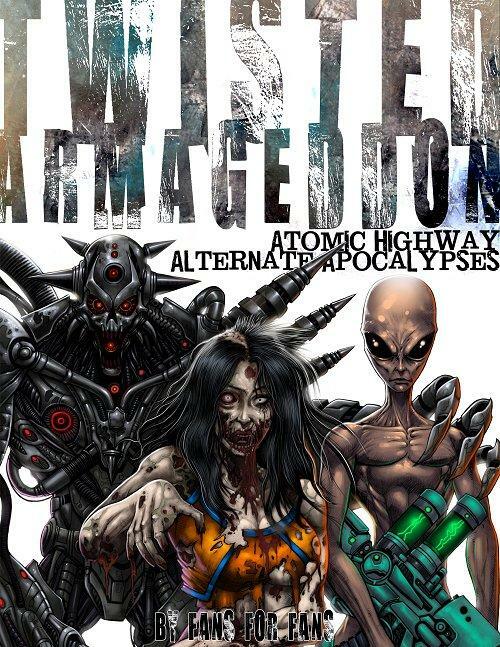 ~ Colin"
Great idea Colin and great cover art too! I'm sold! Where do I direct my PayPal payment to? So I guess we'll all be watching Radioactive Ape Designs (http://radioactiveapedesigns.com/) for more about the new release. 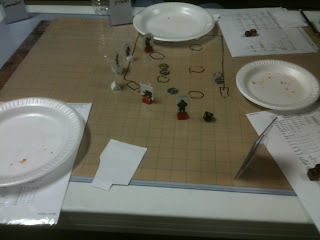 Let me set the record straight: I strongly dislike using miniatures in role playing games. I'd much rather see the action in my head and ask the DM, "Am I able to..." than move my six squares trying not to give combat advantage and take any opportunity attacks. 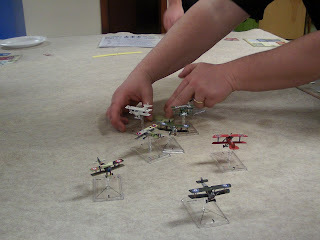 In my opinion, miniatures slow combat down to a crawl and are no fun. I don't care about painting miniatures or how cool they look. If you MUST have miniatures, broken piece of glass, bottle cap, or a soggy pretzel would be just fine with me. After all, it's simply a token representing my character's location on a grid. Who cares what it looks like? All of this is to say that I am happy about several developments: Wizards has been packaging double sided token in with some of their recent releases (Gamma World, DnD4e), Printable PDF markers have been increasing in number and quality, and cardboard stand-up miniatures are making a comeback. 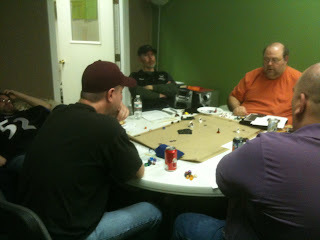 Want a legion of durable, 3D, full color miniatures on the cheap? 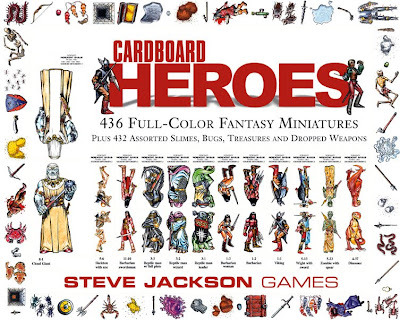 Cardboard Heroes are for you. I still have my complete class Marvel RPG cardboard miniature collection. Those were triangular prisms that were fairly easy to knock over. 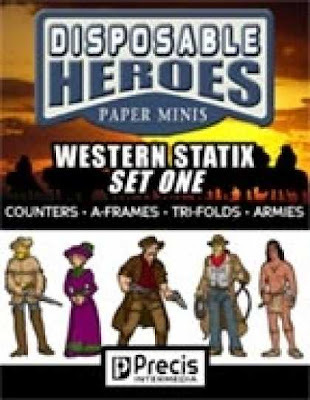 The new line of cardboard miniatures is flat (showing the front and the back of the character) and is affixed to a plastic base or glued onto a penny. This makes for a much more stable miniature. They make them for every genre you can imagine AND they make cool prop scenery as well. Need a dungeon? How about a castle? 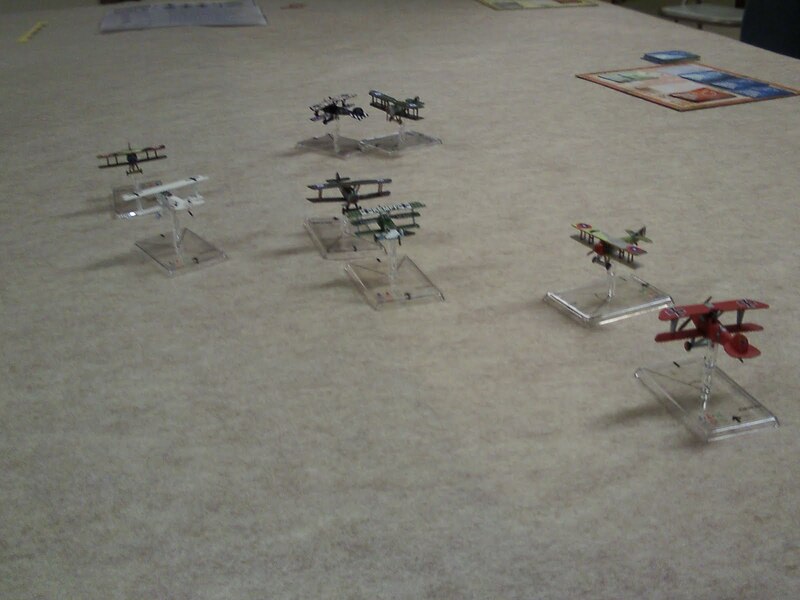 Cardboard miniatures are the way to go. If you're lucky, Comic Store West still should have some of these bad boys in stock. 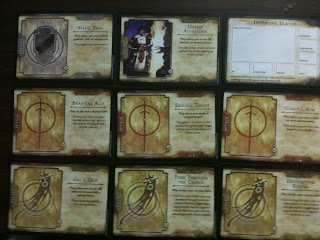 Here is a photo of some of the cards provided for the Encounters Night. Spoke with a few players who have played with these cards and they are hating it. 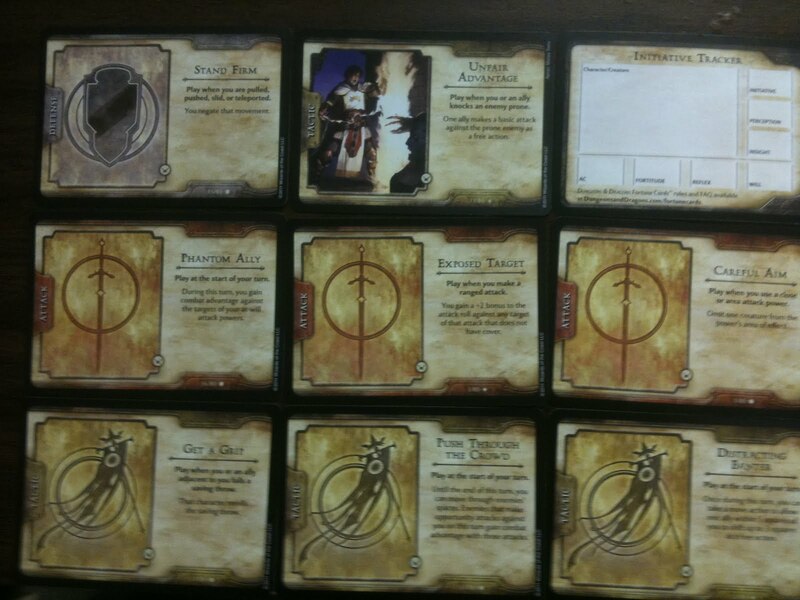 I'm going to try and get the rest of KGS to play a one off D&D session and use these cards. 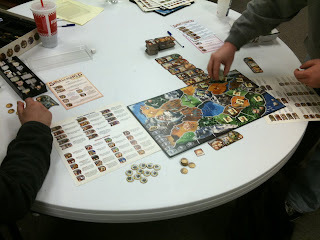 I like the concept of the cards in Gamma World but the D&D cards don't impress me. 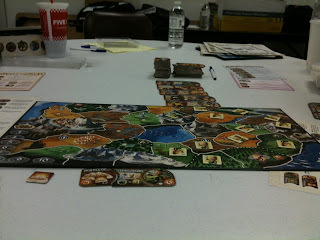 KGS took a break from Role Playing to play the boardgame - SmallWorld. Look for a full review later this week. Will this be the end of D&D? 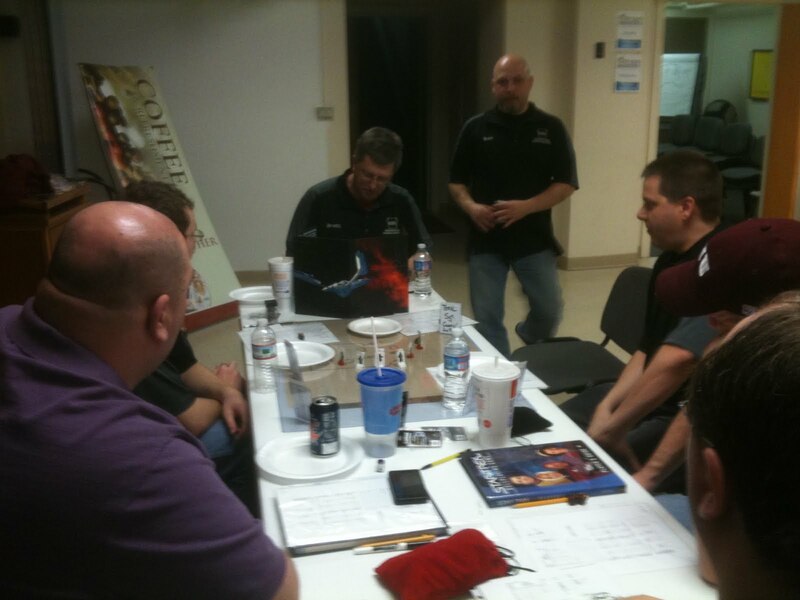 I'm a huge fan of HeroClix. I love the 'plastic crack'. I have about 2000 or so super hero army men. I don't time to play often anymore but still collect and judge the game at Comic Store West. 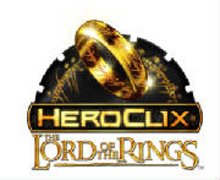 Wizkids and NECA have just announced that a Lord of the Rings HeroClix system is coming in 2011. Read all about it here. I am extremely excited about this, I bought the LOTR miniature game that came out about 8 years ago (and flopped) and it just didn't play very well. Now Wizkids is making a run at it and I think this is going to do very well for them; why you may ask? They are making it fully compatible with HeroClix. Now I can have Hawkeye and Legolis fight !! I think NECA is doing all the right stuff with the Wizkids product that they bought. I think all of the clix based games need to be 100% compatible with each other; they can call it the CLIX ENGINE and have HeroClix, HorrorClix, LOTRClix, MechClix, FantasyClix, ArmyClix, Star TrekClix, etc. 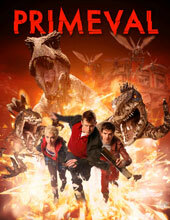 Just announce from Cubicle 7 (makers of Dr Who RPG) the Primeval RPG. I'm a big fan of the show so I may pick this game up. This got me to thinking about other TV Shows or Movie Franchises that have not yet been made into a RPG. I put a poll up to the right looking for answers. 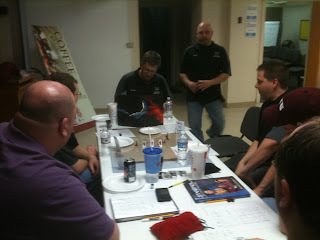 and for those coming to Origins 2011, No you can't get any hints from Jason's Laptop! 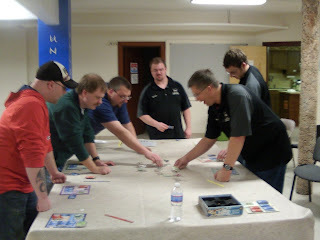 Mid game you can see that nobody knows which direction their going! 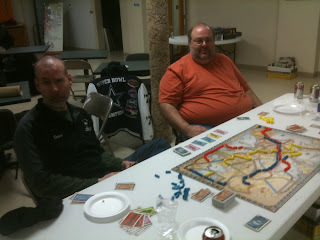 Left to right: James Brother In-Law (Sorry I can't remember your name! 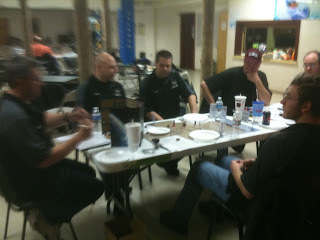 ), Jon, James, Scott, Young Brian and Brett. 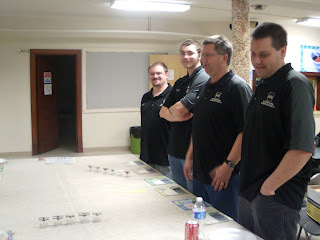 Soon after the start of the second game everyone had targets! 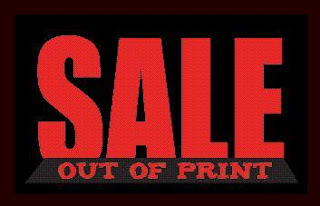 Just wanted you all to know that Mongoose is having a clearance sale of their out of print items. Most items are 25% or more off and with a quick look through I've added up an easy $50 worth of stuff that I've wanted to get. Its a steal at this price! I bought it a few years ago for $35 or so (followed by buying Adventures in the Hyborian Age, Cimmeria, Aquilonia and Heretics of Tarantia) for a group that wanted to play it. They we're great reads and the rules are an easy twist on 3rd Edition D&D (which I'd never played at that time)with magic really having that nasty deadly feel that Robert E. Howard instilled into his writings. So if you like Conan and you don't own this buy it! We know Battlefield Evolution has died an horrible death and Conan is having licensing issues with the plans in the works for Arnold to do another movie. That said, whats happening with the Judge Dread: Mega City One Archives books? They're on clearance! Does this mean that they're dropping the Judge Dead Mega City One Archives line?? 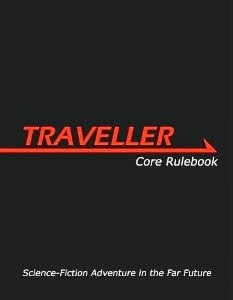 And before anyone says that the Judge Dread line is dead let me mention that Mongoose has put out a Miniature skirmish rule set for playtesting along with releasing affordable Judge Dread Miniatures. Affordable being $3.00 each compared to Wargames Foundry who wants $7.15 each. So ah...hey back to the Sale....let me know what you get. This was my first JohnCon (even though I have been invited to 2 or 3 others). I chose to play in the Star Trek and Mutants and Masterminds sessions because I own both of the games and would like to run a game in each of the worlds later this year. NOTE - Special thanks to Scott for getting my Dallas Cowboy SuperBowl jacket in the photo !!! I hate people. Especially the rest of the KGS. No I'm just kidding (or am I)? 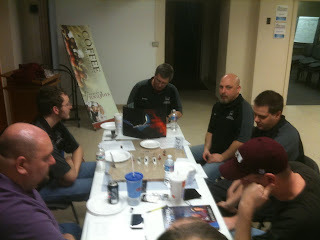 Anyway we will be podcasting about are experiences from Johncon this Tuesday so look for the full review on Wednesday. In the meantime Jason one of the Crimson Hand Gamers (another local group that I refer to as our competition) pointed me to HeroLabs. This seems like a very cool character creator software for a variety of RPG games including Pathfinder, Mutants and MasterMinds and Savage Worlds. I'm thinking about purchasing the product, what are your thoughts? Check out their site here. This Saturday the Keystone Gaming Society will be headed off to Shippensburg for a full day of gaming. Look for recaps of the day's games soon. Over the years, Dungeons and Dragons Monster Manuals have been filled with awesome creatures, but DMs have been reluctant to use the rarer monsters because they don’t have the miniature, they have to substitute it with a miniature of roughly the same size and basic shape, or even worse: “OK guys, this Coke can represents a 15th level Cacodaemon. Uh, the daemon is red and so’s the can, so that kinda works. 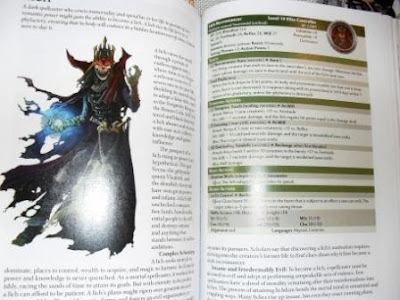 Right, guys?” D&D Essentials Monster Vault takes the brilliant idea of combining a D&D Monster Manual with full-color tokens for tabletop combat, and executes it nearly flawlessly. 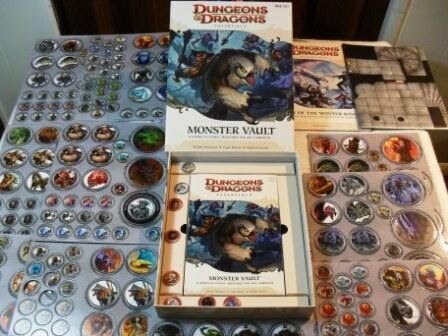 The 320-page Monster Vault book is digest-sized, as are all the Essentials books, and fits nicely within the Vault’s sturdy box. It contains 63 basic monster types, which are further divided into different varieties and levels, resulting in over 300 monsters to choose from. 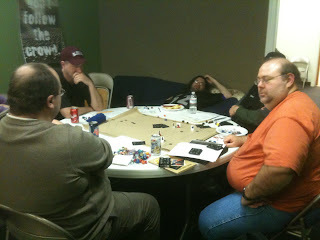 Each one of these monsters is represented by a full-color token of proper size. Both sides show the same creature, but one side is circled with a red border, indicating that the monster is bloodied. Huge creatures only have one token, but most large and medium creatures get at least two tokens, and some medium creatures get as many as eight. All the large and medium tokens are numbered to make it easier for the DM to keep track. Artwork throughout is very good, and each monster stat block includes the same picture of the monster as is used in the token. 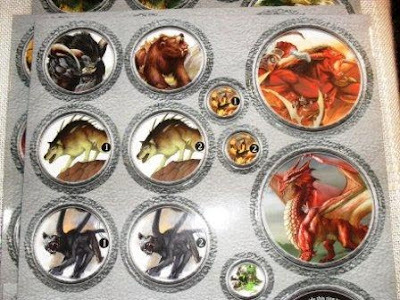 This is key, because the monster’s names are not included on the tokens, so the only way to tell who’s who is from the pictures. I don’t know why names weren’t added: even an abbreviated name would have been helpful. Still, most creatures are easy to recognize from the pictures, so it shouldn’t be major issue. One other complaint. What to do with all the tokens once they’ve been punched out? 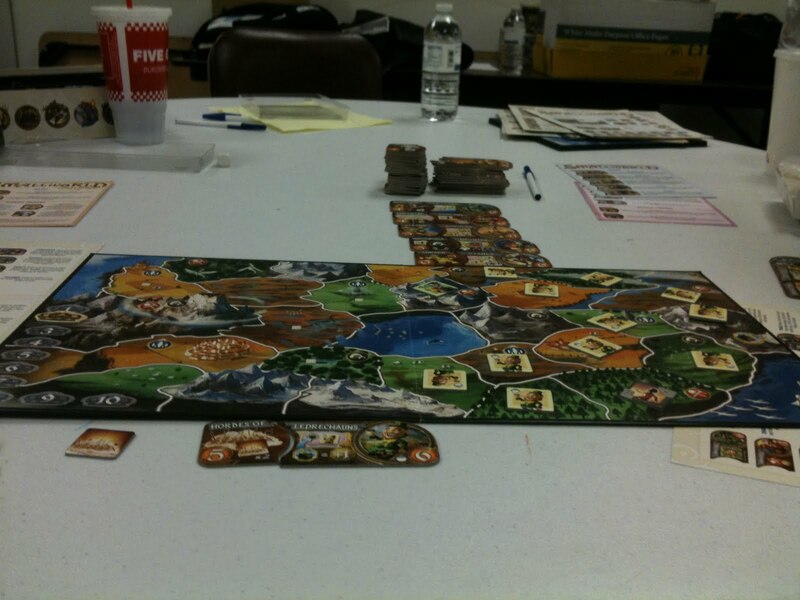 The box, while sturdy, has no pockets or small bags included to make it easier to sort the tokens by monster type or level. This can be a headache when trying to find three zombie tokens in a pile of 300 other tokens. My advice would be to only punch out monsters as you need them, or buy a small plastic storage tray to keep the monsters sorted. The Monster Vault box also includes an adventure for 4th-level characters, Cairn of the Winter King, along with a two-side, full-color map for tabletop combat. While the overall storyline is a little weak, there are some nice set pieces that a clever DM can incorporate into his own adventure. Overall, this is a big win for the Essentials brand and I look forward to including all these monsters in adventures to come.